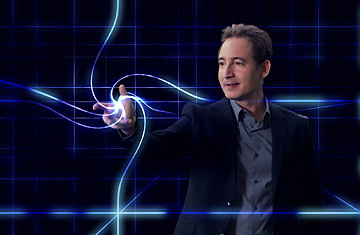 It turns out that Brian Greene isn't all that different from you or me. Sure, he's a top-flight theoretical physicist on the faculty of the ultra-prestigious Columbia University. And yes, he specializes in string theory, which uses such advanced and difficult math that even many physicists can't follow it. In one crucial way, however, Greene really is like the rest of us. "If I just look at mathematical equations," he says, "I don't feel I truly understand what's going on. I have to create a running visual in my mind." Those visuals turn out to be a very good thing for all of us nonphysicists, since the pictures Greene paints for himself he also paints for us. He's done it with words in his best-selling books The Elegant Universe, The Fabric of the Cosmos and The Hidden Reality. And now, for the second time, he's turned one of those books into a documentary series: The Fabric of the Cosmos ran on PBS through November. You can still see all four segments on the Web, but hurry. Failing that, they're available on iTunes or on Nova's website. No matter how you catch the series, it's worth it. Nova's computer-graphics wunderkinder combined with Greene's brilliance at explaining concepts that would normally make your head explode bring surprising clarity to ideas that contradict common sense at every turn. Empty space, for example, isn't really empty, and it isn't just a passive container in which galaxies and planets and light beams move around: it warps and undulates; it stretches and squeezes; it crackles with its own invisible energy, which affects everything within it. Time, meanwhile, doesn't necessarily flow from what-was through what-is and toward what-will-be. It may not flow at all: past, present and future could all be right here, right now  it's just our perception, plus the laws of thermodynamics, that makes it seem some other way. And by the way, what we call the universe may be just one of a zillion parallel universes, some like ours, some totally different, but all of them eternally cut off from each other. There's also the riddle of quantum mechanics, invented in the early 20th century to make sense of how subatomic particles behave. The great physicist Richard Feynman once said of quantum theory, "Don't ask how it can be like that. Nobody knows how it can be like that!" Greene, nonetheless, takes a stab at explaining things. Imagine, he says, that we could shrink to the size of particles. Imagine further that we're in an otherwise familiar situation  a bar, but one whose patrons obey quantum principles. That attractive woman you're chatting up? She's suddenly on the other side of the room, and you are (or Greene himself, who is on-screen most of the time, is) sitting on a different stool. The mix of familiar setting and crazy action  which becomes vividly real through those seamless special effects  makes a far more powerful impression than some old-fashioned diagram or animation ever could. The Fabric of the Cosmos is in many ways the direct heir of Carl Sagan's popular Cosmos series, produced by Nova in the 1980s  and Greene is quick to acknowledge Sagan's influence. "He was a trailblazer, and he's been a model for me. Lots of us who are interested in explaining science to the public view Carl as an iconic hero." It wasn't just Sagan's genius at explanation that laid the groundwork for scientist-popularizers like Greene and his astronomical counterpart, Neil deGrasse Tyson. It was also his willingness to go where no scientist had gone before  specifically, late-night TV, where he was a frequent guest on The Tonight Show with Johnny Carson. Other scientists were appalled: Sagan's ventures outside the ivory tower ultimately kept him from being elected to the prestigious National Academy of Sciences. But Greene routinely shows up on TV to match wits with Jon Stewart and Stephen Colbert, and nobody seems to think it's a problem. Greene is also like Sagan in that he keeps his prime mission in mind  and that mission isn't just to entertain you. "These ideas are so vital to a full picture of reality," he says, "that even though they've been explained before, people haven't really absorbed them." It matters, he says, because "everything from climate change to nanotechnology to genetically modified foods to costly spaceflights involves scientific issues. I think we can help create a cultural shift where science isn't seen as an esoteric subject but rather as part of a full life, central to participation in the democratic process." Greene is serious enough about this mission that he co-founded the annual World Science Festival, which attempts to bridge the science-culture divide when it is held in New York City every spring. In a nation where so many people deny evolution and think vaccines cause rather than prevent disease, Greene's got a big job ahead of him. But if he keeps churning out compelling videos like The Fabric of the Cosmos, he might actually get people to understand at least a little bit of modern physics  and a bigger bit of the world it makes possible. Read about Amazon.com striking a deal to carry PBS programs. Read about a Nova episode regarding the Pearl Harbor events.